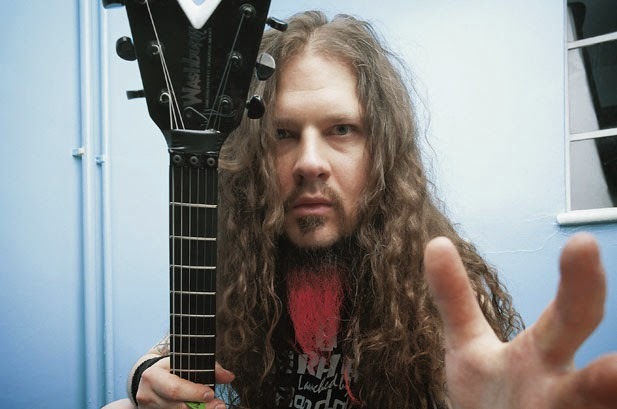 Hard to believe it's been a full 10 years since "Dimebag" Darrell Abbott was shot to death as he performed onstage with his band, Damageplan, at the Alrosa Villa in Columbus, OH. The result is my almost-exact recollection of what occurred that day—a rarity for me. Probably the only other date and time this could be said for is September 11, 2001 in New York City. "They call marijuana a crutch..."
"...Yeah, but crutches help people." The lot of us went and had dinner with Tommy afterwards and it blew my mind that he actually spoke in THAT lackadaisical voice; somehow surprised by how chill he was, considering he'd just gotten out of jail for selling glass pipes online. I can't remember if it was there, or on my way home when I got a text message alerting me to a shooting at the Damageplan show. Truth be told, I can't even remember if it was my old editor at Revolver, or mutual friends. I was shocked as much as any fan could be, but didn't want to spread false rumors. Then I started thinking about the vulnerability of my friends and idols in bands (especially as Superjoint Ritual was starting to resurface). Like so many others, I spent the night reaching out to my network of friends, kept others informed, and hoped against logic that the news was false; that somehow this brother in metal was still with us. Sadly, national news confirmed the worst. There were three other people murdered by gunman Nathan Gale that night, including a fan who was trying to give Dimebag CPR. Let's not forget them, either.